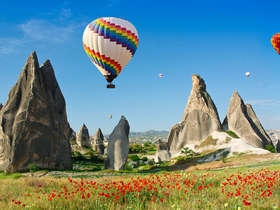 Turkey has to be seen to be believed! 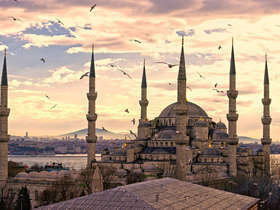 From the former capital of Istanbul, to the fairy-chimneys of Cappadocia and the stunning classical cities dotting the western coastline, the volume of sites is extraordinary. 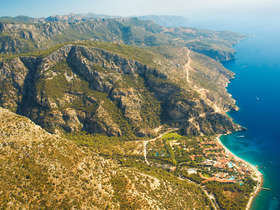 With such a range of opportunities the question as to where to travel in Turkey is far from straight forward. Corinthian’s destination guides and suggested itineraries are a good starting point, but we would encourage you to take advantage of our tailor-made holidays service. 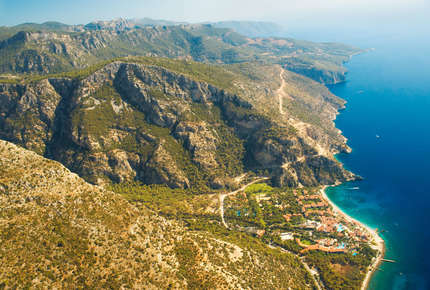 With their vast accumulated knowledge, and years of experience in designing luxury holidays in Turkey, our destination specialists will ensure that your holiday experience is seamless from the moment you contact us. 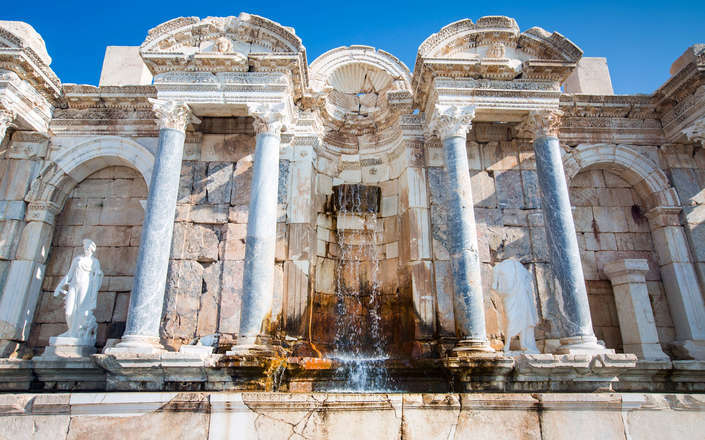 Inland from the central Aegean coast, amongst the beautiful scenery of the Taurus Mountains, are to be found one of Turkey’s great natural wonders and several of her most important classical sites. 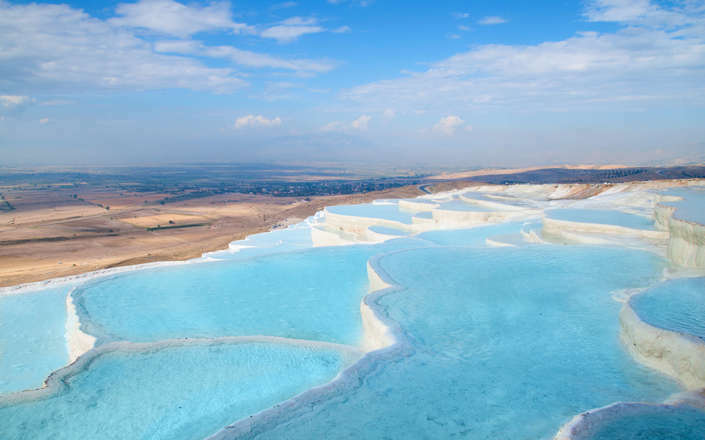 Pamukkale’s white cotton bud-like travertine terraces and lovely opaque chalky blue pools are one of Turkey’s great natural wonders. 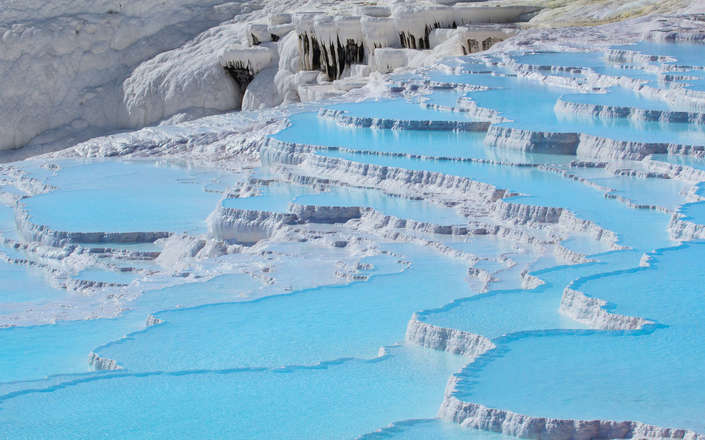 Created over the millennia by deposits left by mineral rich hot springs, the colour of the terraces changes according to the time of day, ranging from a brilliant white at midday to soft pink towards sunset. 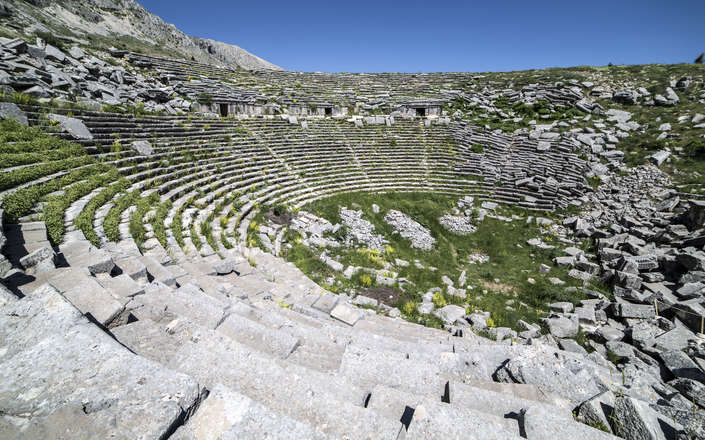 Occupying a dramatic location atop Pamukkale’s terraces are the extensive ruins of the ancient city of Heirapolis, once a great cult centre and place of pilgrimage. The well preserved theatre combined with an impressive colonnaded street and the grand monumental tombs of the extensive necropolis make this site exceedingly impressive. 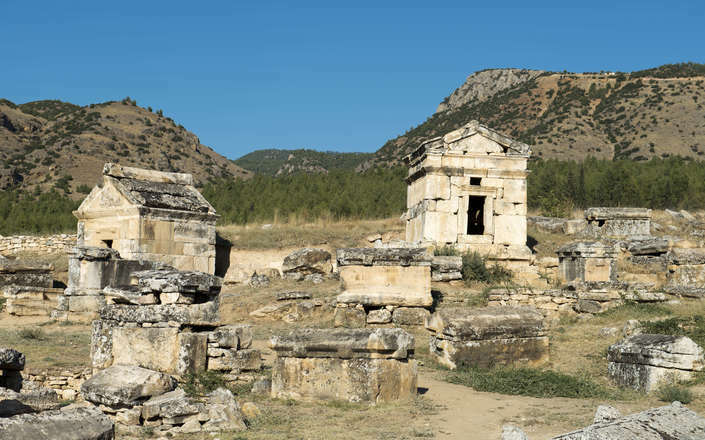 Nearby, on a low hill, are the remains of ancient Laodiceia, a little visited site that was once sumptuously endowed by the Seleucid kings, and is listed in the Book of Revelations as one of the of Seven Churches of Asia. 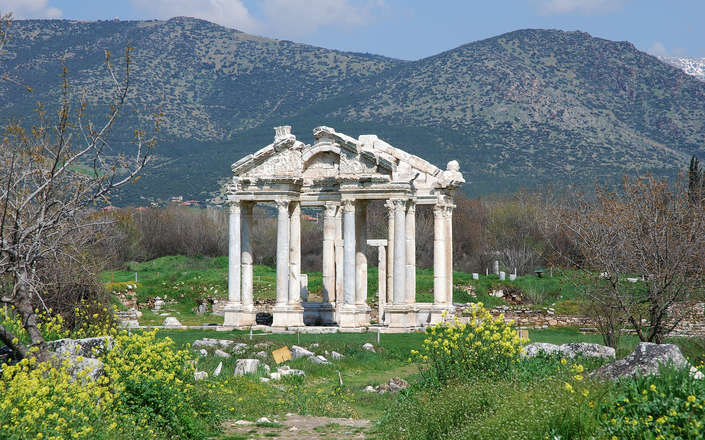 Aphrodisias has a lovely rural location and is one of the most rewarding sites in Turkey. 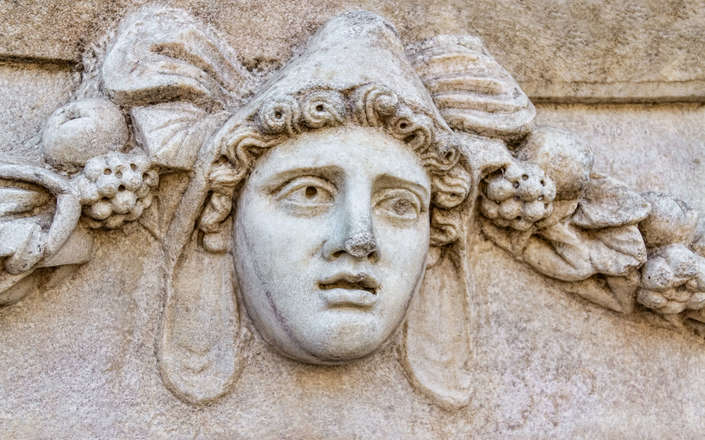 The city was noted for its school of sculpture and was once adorned with some of the most beautiful carved ornamentation in the classical world – a fact that is immediately apparent on entering the site’s stunning museum. 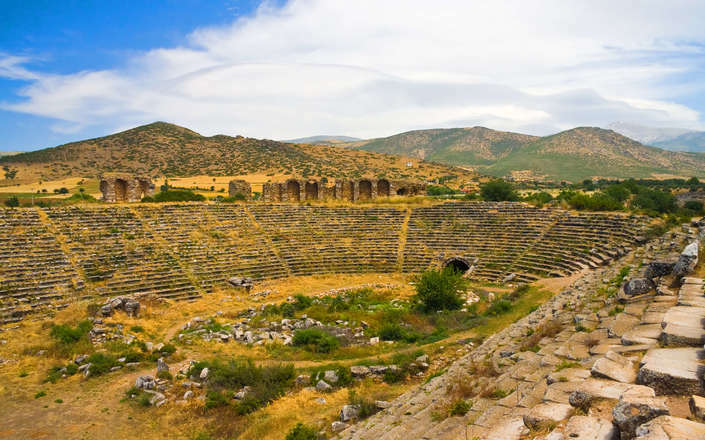 Amongst Aphrodisias’s many fine monuments is an almost completely preserved stadium. 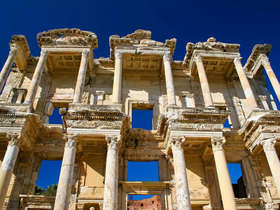 Sardis was the capital of the kings of Lydia and was the seat of Croesus, a monarch of proverbial wealth. Overlooked by most visitors, Sardis is in every way a hidden gem. The stunningly located Temple of Artemis is hugely imposing, as is the restored double storey entrance to the Gymnasium, however, it is the presence of a large and elaborate synagogue at Sardis (bearing testament to the onetime presence of a substantial Jewish community) that makes the site so unique. 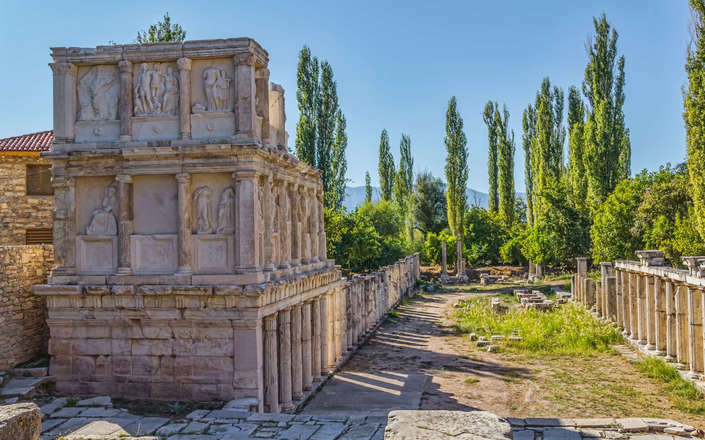 Located high in the Taurus Mountainss, Aphrodisias is one of the most beautiful classical sites in western Turkey. Built directly on top of the travertine terraces, ancient Hierapolis was once a major pilgrimage, healing, and a spa centre. 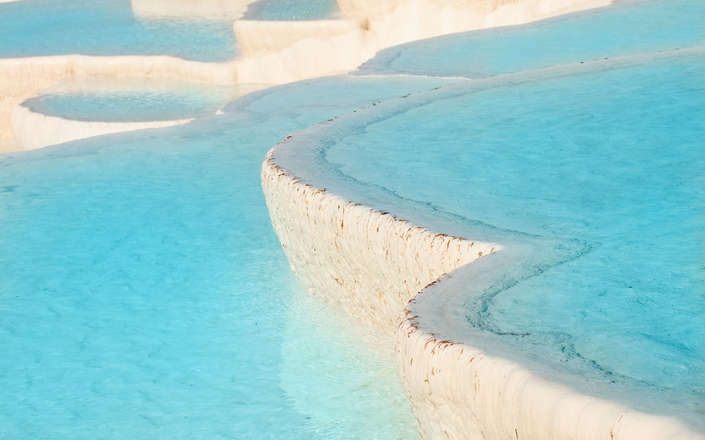 Formed over millions of years by mineral deposits, Pamukkale's terraces are one of Turkey's great natural wonders. 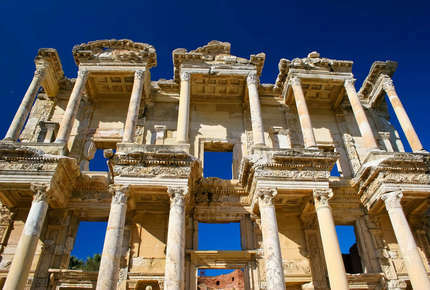 A grand sweep through the Turkey’s stunning Greek, Roman and Byzantine past. 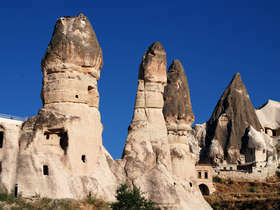 Explore rugged southwestern Turkey and the ruins of ancient Lycia, Phrygia, and Caria.